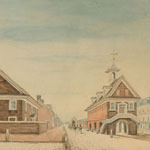 In addition to printed views of Philadelphia, the Print Department also holds a respectable collection of watercolors and drawings graced not only by the works of William L. Breton (ca. 1773-1855) and Benjamin Ridgway Evans (fl. 1857-1891), but now also of Scotch-born David J. Kennedy (1817-1898), a Pennsylvania Railroad agent and amateur watercolorist active 1836 until his death. While different in composition and style, Kennedy’s prints still wonderfully dovetail with the work of his contemporary Evans. 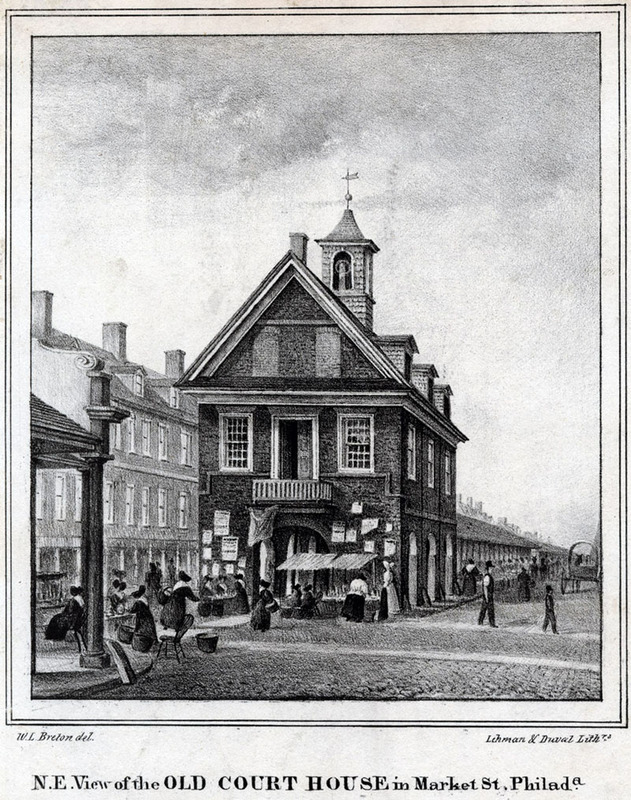 Both men not only shared the same nation of origin, but also studied architecture and documented everyday views of the cityscape of Philadelphia, thus attracting the patronage of antiquarian Ferdinand Dreer. Although the men were both productive from the 1850s and 1880s, the pairs of prints on display represent views of the same area as drawn by Kennedy and Evans a few decades apart and provide an insightful retrospective of the ever changing city. David J. Kennedy. Northeast View from Broad St. and South Penn Square. City of Philadelphia, November 1838. Pen-and-ink, graphite, watercolor and gouache on paper. Acquired from the Jay T. Snider Collection. Benjamin R. Evans. Southeast corner of Broad Street and South Penn Square, 1881. Pen-and-ink and watercolor on paper. City Hall did not always loom over Center City from Broad and Market streets. The site of the building, designed as one of the five public squares of the original plan of Philadelphia, changed over the years. Initially known as Centre Square, the public space contained, as shown, a waterworks by 1800, and then was realigned into four sections and renamed Penn Square during the 1820s. 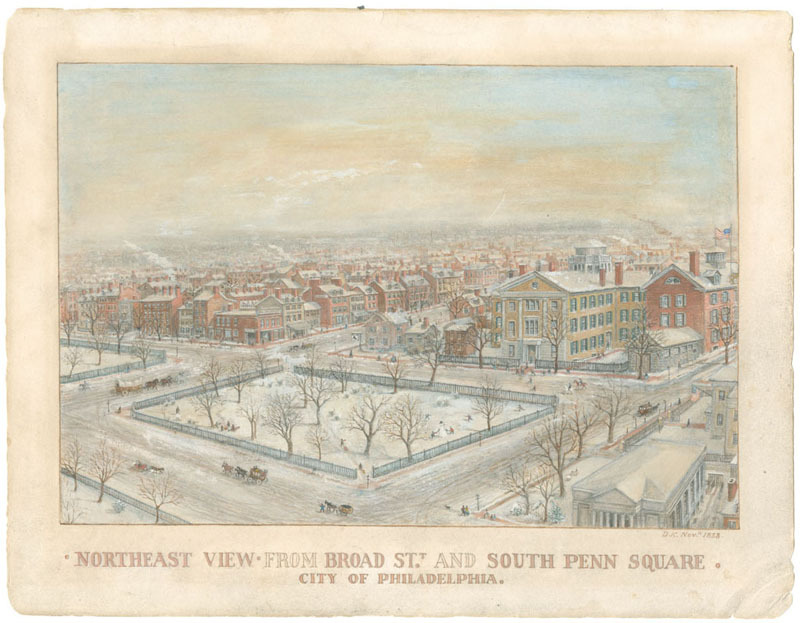 Kennedy’s winter view shows Southeast Penn Square bounded by Broad, Olive, Market, and Juniper streets. The recently completed Central High School for Boys, the city’s first public high school, stands in the right background on Juniper and possibly was the motive for the drawing. 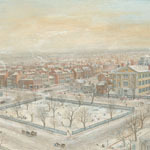 Kennedy also captures, in the lower right, the roof of the second U.S. Mint building completed a few years earlier in 1833 at the northwest corner of Juniper and Thirteenth. 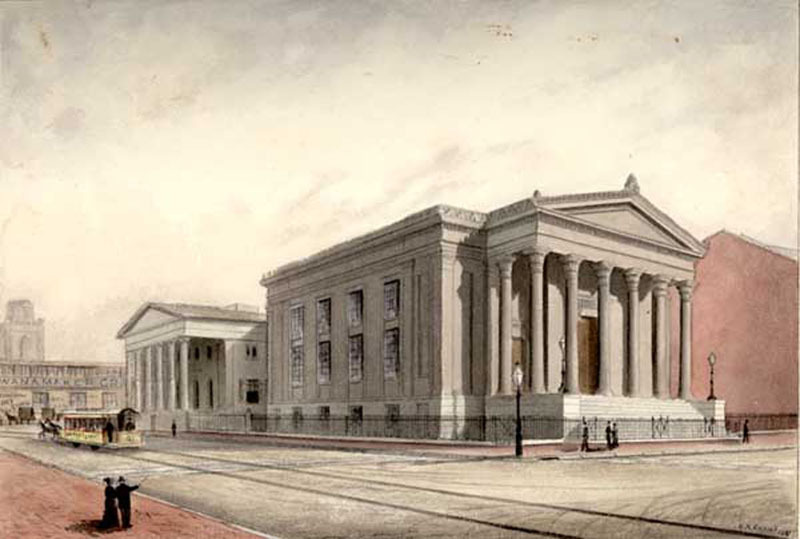 A little over forty years later, the Mint again appears in this 1881 Evans watercolor of the Seventh Presbyterian Church, known as Rev. Lord’s Church, located below Southeast Penn Square. As the annotations to the title indicate, the appearance of the church, like the neighboring square, was about to change, despite the seeming admiration of the pedestrians. The Pennsylvania Railroad sheds, not yet built at the time of the Kennedy view, had been transformed in 1876 into the John Wanamaker Grand Depot, and the “Market Street” streetcar traveling on Broad Street replaced the horse-drawn coach in the Kennedy view. 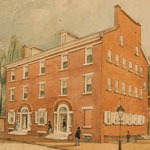 John Fanning Watson had been interested in the history of Philadelphia for decades before he commissioned Frederick DeBourg Richards to create a visual record of the extant historic architecture of the city in the 1850s. 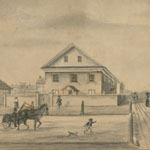 More than twenty years earlier Watson wrote Annals of Philadelphia (1830), a seminal history of Philadelphia that relied heavily on the illustrative work of William L. Breton, who like the other watercolorists highlighted here was a British émigré and artist of everyday street views. Breton arrived in Philadelphia about 1824, and though he lacked formal training, he not only created watercolors, but worked in the burgeoning profession of lithography, a planographic printing process on stone. William L. Breton. 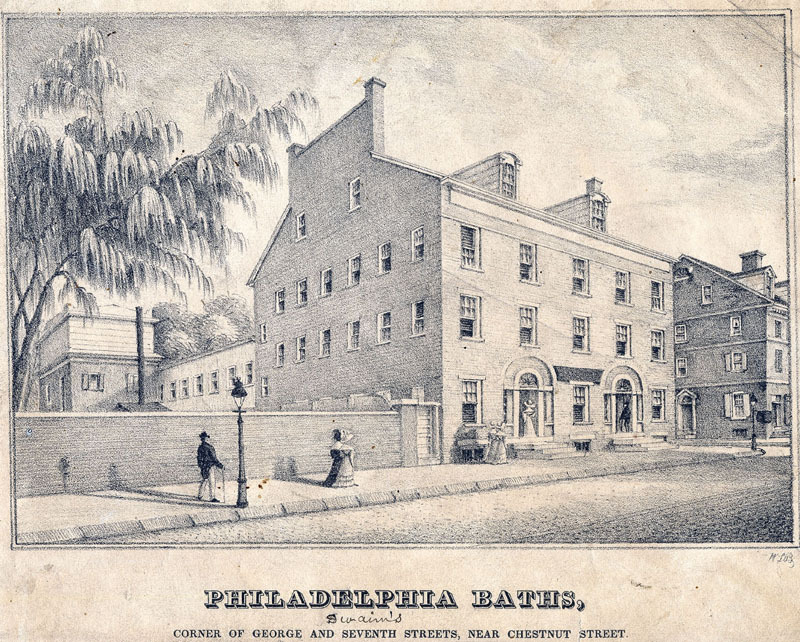 Philadelphia Baths, Corner of George and Seventh Streets, near Chestnut Street (Philadelphia: Kennedy & Lucas, ca. 1829). Lithograph. 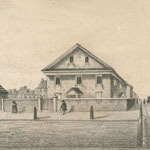 William L. Breton.Philadelphia Bathing Establishment erected 1827 by W. Swaim, ca. 1829. Pen-and-ink and watercolor on paper. Acquired from the Jay T. Snider Collection. Lithographs, like engravings, were often based on other original works, such as watercolor studies. 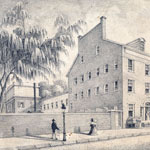 Breton served as artist and lithographer of this view and a later advertisement of the bath house established in 1828 by patent medicine proprietor William Swaim (1781-1846). 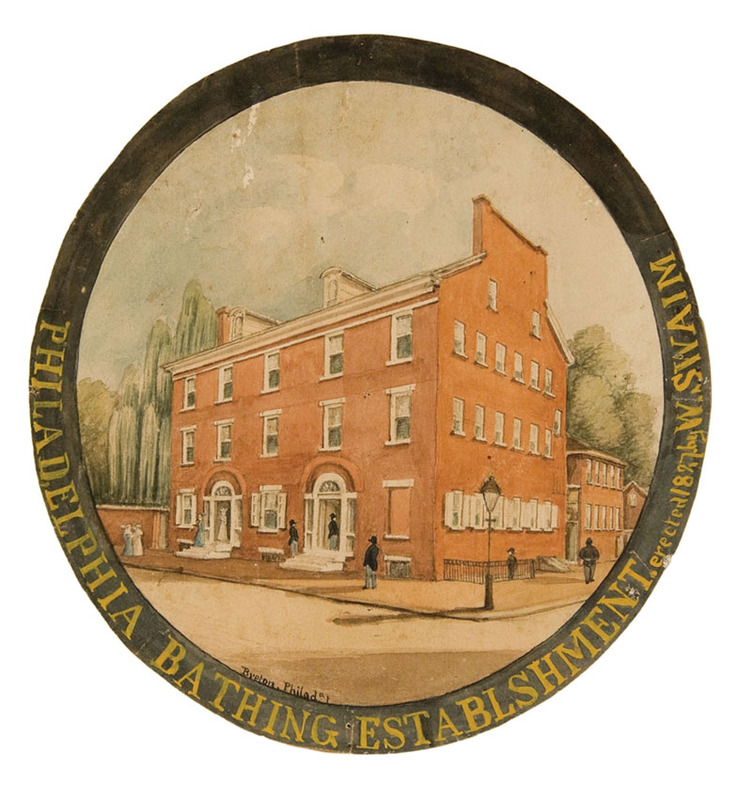 As depicted by the customers’ activity, Swaim’s Baths contained separate apartments for women and men. Inside, the patrons found fifty tubs made of tin-plated copper or Italian marble in which to refresh themselves. The male patrons had access to an additional form of refreshment as well, by way of a bar room. William F. Breton. 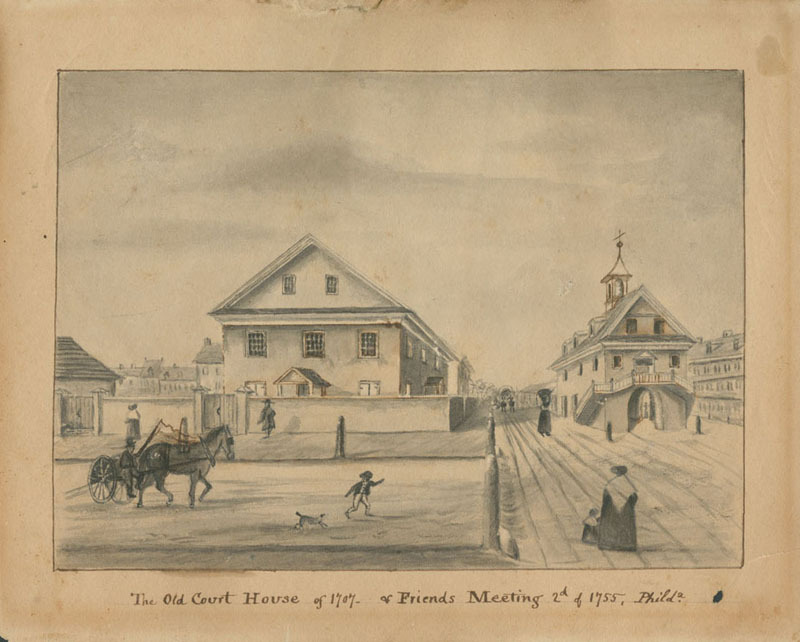 The Old Court House of 1707 & Friends Meeting 2d of 1755, Philda., ca. 1830. Pen-and-ink and watercolor on paper. Acquired from the Jay T. Snider Collection. William. F. Breton. Old Court House & Second Friend's Meeting, ca. 1830.Pen-and-ink and watercolor on paper. William L. Breton. “The old Court House & Friends Meeting” (Philadelphia: Kennedy & Lucas Lith., 1830) published in John F. Watson, Annals of Philadelphia (Philadelphia: E. L. Carey & A. Hart, 1830). Lithograph. When Watson commissioned Breton about 1828 to supply the illustrations for his forthcoming Annals, both men probably little realized the ordeal in bringing the prints to fruition. 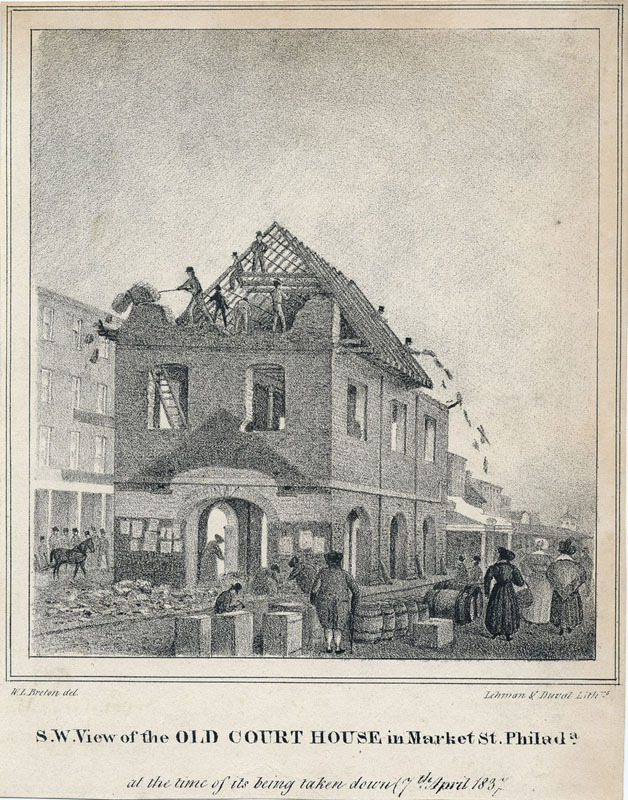 Over a dozen prints in the book would illustrate historic buildings still standing at that time, such as the Old Court House, or already destroyed, such as the Office of Foreign Affairs. 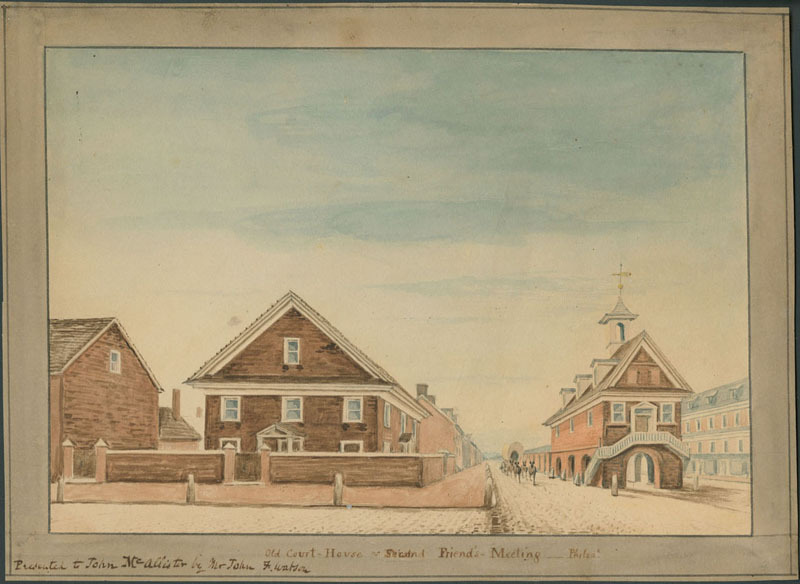 Using his own watercolor studies of extant buildings and Watson’s notes and sketches, Breton created at least sixteen lithographs and four engravings for the work. During the commission, Breton not only encountered the difficulty of creating two images on one printing surface, but also had to redraw illustrations due to broken lithographic stones. The lithograph displayed here did not experience these setbacks. Printed by the first successful commercial Philadelphia lithographic firm, Kennedy & Lucas, the lithograph shows the changes that occur from a study to a final state, including the deletion and repositioning of figures. William L. Breton. N. E. View of the Old Court House in Market St. Philada. (Philadelphia: Lehman & Duval lithrs., 1837). Lithograph. William L. Breton. 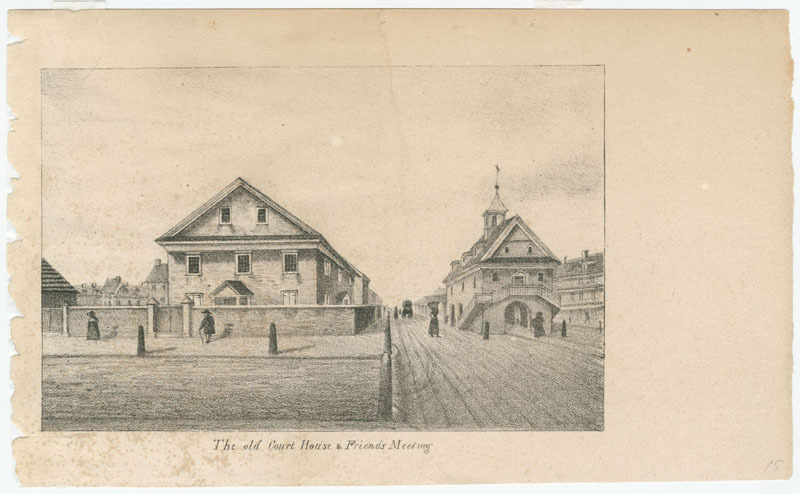 S. W. View of the Old Court House in Market St. at the time of its being taken down Apr. 7, 1837 (Philadelphia: Lehman & Duval lithrs., 1837). Lithograph. 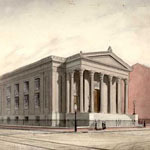 Breton’s continued interest in the Old Court House, originally piqued by his work for Watson’s Annals, is shown by this depiction of the historic building shortly before its demolition. 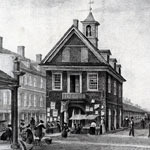 The court house, built in 1707 by carpenter Samuel Powell and utilized as a multi-purposed municipal building, became functionally obsolete when the State House (now Independence Hall) opened in 1748. Unlike the Annals illustration, the lithograph contains more of the lively foreground activity, including patrons at the adjoining market sheds (built 1710), and is reminiscent of the earlier watercolor study. 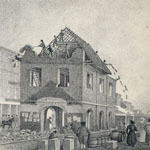 The broadsides covering the court house, typical for an abandoned building of that time, symbolize its pending destruction on April 7, 1837, as documented in the companion print S. W. View of the Old Court House in Market Street, Philada.